On Episode 157 of CrossFit Radio, host Justin Judkins interviewed CrossFit success story Amber Wilson and Games hopeful Sarah Rodriquez, who also co-owns CrossFit La Verne. This episode was webcast live at 6 p.m. PDT on Wednesday, Feb. 2, 2011. 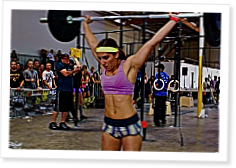 3:45 Amber Wilson is an athlete at Clear Lake CrossFit. She started CrossFit one year ago and has seen amazing health benefits because of the intense exercise and focused nutrition plan. She gave her first impressions of CrossFit and explained how she wondered where the treadmills and air conditioning were. She also talked about how important the community has been to her success and explained how necessary it was for her to change her thinking in regards to diet and nutrition in order to reach her goals. 29:20 As co-owner of CrossFit La Verne, Sarah Rodriquez is always encouraging her athletes to compete in the Games’ qualifiers. Sarah leads from the front and is quite the competitor herself. She came on the show to talk about her road to the Games. She explained how important it is to gain experience in the competitive arena and described some of the competitions she has been in lately. She also spoke about owning an affiliate and growing it over time. She has moved her box twice and described that process, and she outlined which equipment was a priority as they started the affiliate with limited funds.